Madeleine Albright is a Nerdy Chick extraordinaire! She has served our country as the United States Ambassador to the United Nations and as the 64th United States Secretary of State — and, oh, by the way, the first woman to ever hold that office. 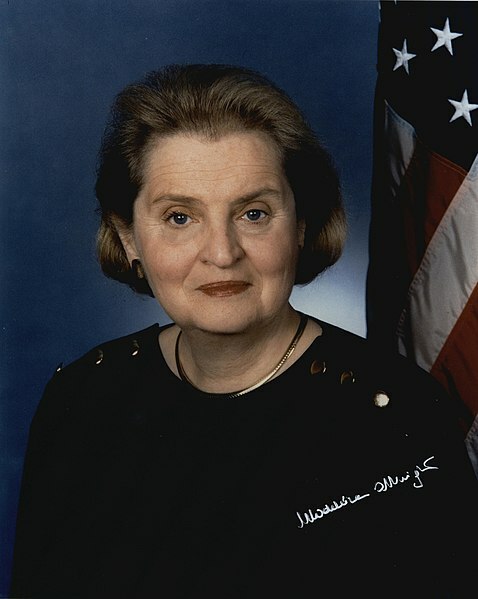 She has a PhD from Columbia University, she has received the Presidential Medal of Freedom, she has served on the Board of Directors of the New York Stock Exchange, she is a Professor of International Relations at Georgetown University’s Walsh School of Foreign Service, and just to top all that off, she is fluent in English, French, Russian, and Czech. Oh, and she speaks and reads Polish and Serbo-Croatian, too. I wonder if she has a cape and mask to go with all those superpowers? Read more about Madeleine HERE or HERE. This entry was posted in The Quotable Nerdy Chick and tagged American women, brainy women quotes, famous american women, famous quotes, famous women quotes, Madeleine Albright, Madeleine Albright quotes, nerdy chick, nerdy chick quotes, Quotable Nerdy Chick, quote, quotes, quotes from smart women, quotes from women, smart female quotes, smart females, smart lady quotes, smart quotes, Smart woman quotes, smart women, smart women quotes, Women in leadership.